I try not to pre-judge things, but when you’ve lived in the same place for more than a little while, you can start to think you’ve seen most every neighborhood. 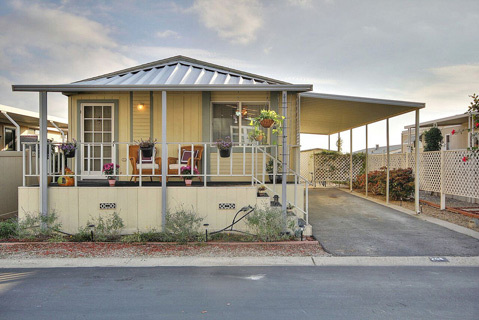 When I decided to go visit a new mobile-home listing in Carpinteria last week, I thought I knew where I was going and what to expect. Boy, was I wrong. I turned off the freeway at Santa Claus Lane, and before I even got to the park, I passed an orchid nursery, an avocado ranch, a dog boarding camp, and a miniature horse farm. This variety of sights was all within a quaint quarter-mile area, with the mountains on one side and the ocean on the other. I realized that I had taken the scenic route, but the picturesque detour was well worth the drive. As I entered Sandpiper Village, I again chose the long way around. Driving along streets with names such as Beach Street, Sunset View, and Pacific View Drive, I smiled at the pretty landscaping, the obvious pride-of-ownership, and the quiet, beachy, country-lane atmosphere. A playhouse was a sign that this was an all-ages park, and a beagle sitting in the sun told me that, yes, pets are allowed. I found home #204 toward the back in what appeared to be a quiet corner of the quiet section of the park. The sunny yellow exterior and friendly, flower-laden porch beckoned me up a short staircase to the front door. Once inside, I was surprised by the spacious, modern interior with angled walls and high ceilings. The front room is an airy living room/dining room combo with big windows and lots of light. The kitchen is behind a clever alcove, which separates the spaces yet keeps the feeling open. The kitchen itself is cute, efficient, and retro in feel. Its green-edged, white countertops echo the unexpected angles of the front room with an off-kilter counter, offering both personality and additional prep space. A hallway leads back to the two bedrooms and two full baths, with a side door out to the backyard, where there’s enough room for a garden and even an outdoor-patio eating area. The home is situated to enjoy both mountain views from the front porch and a peek of the ocean from the back bedroom. Laundry, a carport, and a storage shed in the back provide all of the amenities of a “real” home. I learned that the clubhouse I had passed on my way in offers a pool, spa, tennis courts, a gym, and even a dog park for year-round, on-site recreation. Of course, Santa Claus Lane and its beautiful beach are practically next door, and downtown Carpinteria is just down the road. My visit to Sandpiper Village left me feeling like I had uncovered another hidden jewel in our community: a mobile-home park that looks, acts, and feels much more like a seaside resort. 3950 Via Real, #204, is currently for sale in Carpinteria, listed by Kalia Rork of Berkshire Hathaway HomeServices. Reach Kalia at (805) 689-0614 or kalia@liveinsb.com.